The 7th generation "Bristol Ridge" A-series desktop APUs aren't a launch platform for ZEN. These chips feature up to four CPU cores based on the "Excavator" architecture, AMD's final implementation of the modular CPU architecture it introduced with "Bulldozer," way back in 2011. These cores are mated with an integrated GPU based on the Graphics CoreNext 1.2 architecture. You get up to 8 GCN compute units, working out to up to 512 stream processors. AMD is launching eight SKUs in the series, of which six are quad-core, two dual-core. The quad-core parts with 8 GCN compute units are pitted into the A12-9800 series; quad-core parts with 6 GCN compute units as A10-9700 series, and quad-core with 6 GCN CUs and lower iGPU clock bands as A8-9600 series. The dual-core parts with 6 or 4 GCN CUs are slotted in the A6-9500 series. Parts with quad-core CPU but completely lacking in integrated graphics, are slotted in the Athlon X4 series. waiting for Zen and new AM4 motherboards. So these are SoCs, but not with Zen cores? The CPU has native USB3.1, the heck I missed that. When was the first time it showed up? AMD Zen 9 high perform 4 Am4 socket 0 revision would have made more sense and would have fit in with the current GPU naming scheme. I bet they will dump the old naming scheme, put these chipsets as rebrand with whole new CPU group with Zen core. To ditch shameful the past I guess. Dont we have an entire pc as a usb stick already? Not good enough for Zen you mean? They're not APU's, so I assume they'll work differently. Also, board controllers. Since its not Zen, no. 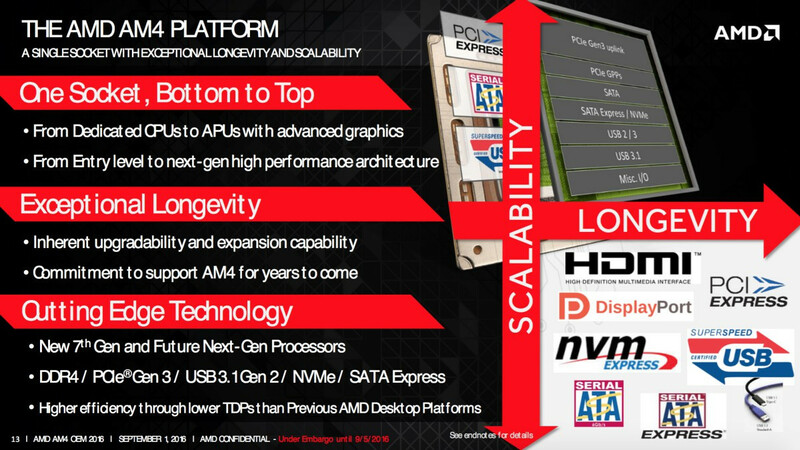 Wasn't Kabini the first SoC from AMD? Some of the Geode chips integrated the same amount of functions. These are Mainstream, they have yet to announce the Performance versions. Hence my comment as this looks pathetic. So with these chips are they trying bypass the old North-South bridge design to encourage more ITX boards? Maybe they should name the Zen line like that: "AMD Zen 3 XXXX / Zen 5 XXXX / Zen 7 XXXX". No more "FX" please. I'm curious to see motherboards, power consumption and performance. The stupidity in this company has become a tradition. 8 PCie lanes Gen3.0 on APUs and only 4 or 6 PCie lanes Gen 2.0 on those "chipsets". These people really like to shoot themselves.